Ian Fleming mentions James Bond’s razor on several occasions, first in On Her Majesty’s Secret Service when it was an old fashioned heavy-toothed Gillette, which he uses as a knuckle-duster. By the time of the short story 007 in New York and finally The Man With The Golden Gun, Bond has switched to a Hoffritz razor of the same pattern – we learn that the handle is useful for hiding what Fleming calls the “minor tools of espionage – codes, microdot developers, cyanide and other pills”. Bond makes a mark on the handle to see whether it is disturbed while he is away from his room, and when he returns of course it is, although we never learn if he was actually hiding anything in his razor. Because of this I had thought about buying a Hoffritz on eBay for some time now, but have never actually got around to it. Although Hoffritz still exists, it no longer sells razors, so a brand new Hoffritz is out of the question. And I’ve also recently started to read that many people consider the old style safety razors superior to the modern cartridge style razors as they give a closer shave – and are no worse for nicks. While I haven’t been able to verify for sure that Merkur did produce the Hoffritz razors, this claim does appear in several sources online. Today Merkur is owned by DOVO Solingen thanks to a takeover in 1996. Although these are not branded Hoffritz, they still produce razors of the same pattern mentioned by Fleming, although it is difficult to be sure with any certainty that these are similar in design to the old Hoffritz. 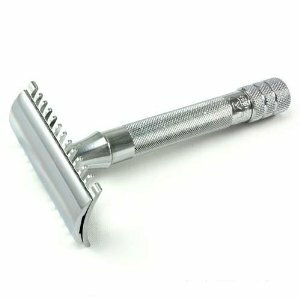 There are several possibilities that match James Bond’s razor – that is to say the heavy-toothed type – including the Merkur 15C and 11C, available online from Amazon. Apparently the “barber pole” handle (seen on the 12C and other models) was introduced later and therefore incorrect. Much enjoyed the Skyfall Premiere stream. How was the film? I see it on Friday. Merkur definitely manufactured for Hoffritz. At least, over the years I have picked this up from a number of separate and independant sources. The 11c that you link to has the standard modern Merkur handle which is unlikely to have been around at the time of OHMSS. The 15c seems to be more of the period. My Merkur 1904 open tooth was bought in Paris earlier this year. It is a replica, recently introduced by Merkur, with a smaller octagonal handle and is nickel plated, giving it a very slightly yellow tint (not as silver as chrome). I would like to think that Bond’s Hoffritz was the same or pretty similar. However, I also have a Merkur 33C. It has heavy “teeth” on it that resemble the dentil woodwork all over my house. This razor is superior to Gillette’s. No doubt someone will prove Merkur wasn’t making this razor in time for Fleming to have used it but I like to believe the 33C was Bond’s razor. The “traditional” safety razor has been in my life since childhood; my father’s was issued in the Army & I believe it was a Hoffritz or a very near copy. He gave it to my nefew & I havn’t seen it since. I was issued with a similar Gillette model when I joined the USAF, lost that one as well! I have to get a Hoffritz if it kills me. Good art. Merkur produced mainly two razors for Hoffritz: one slant-bar (with a very slight change to the nowadays Model #37) and a closed comb razor (now Model #34, which was produced since 1931 without any changes since then and ever and still by far the most popular model). I would suspect that Bond also used the #34. Esp. after the introduction of the closed comb Aristocrat, the Tech, and later the Super Speed (or Rocket when Made in England) as closed comb razors which evolved milder with every model to succeed the open comb versions and the (milder) New Improved open comb, it would have been the only choice in the 1950s and 60s to get a hefty and more direct razor for heavier beards than the mild Gillettes (even as adjustables as used in the movie Goldfinger, the razors are very much on the mild side). The Gillettes are much more about giving more shaving comfort for average beards, whereas the Merkurs are more about getting clean shaves even with heavy beards.